Welcome to the thirteenth day of 31 Days of Simple Organization! To read all the posts in order, visit the Overview Page. 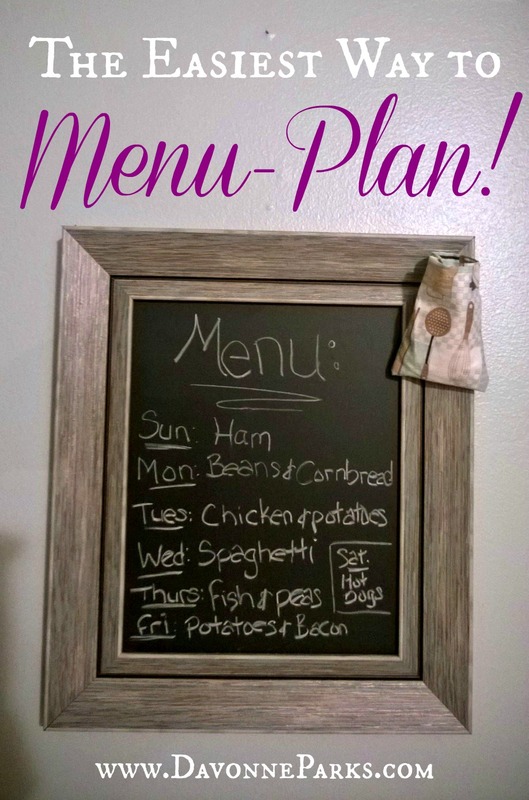 I’ve tried menu planning so many times and it’s always been a huge fail! I’ve thought a lot about why menu planning doesn’t seem to work for me, and I think I’ve finally figured it out: I over-complicate the system. 1) Check the fridge and freezer to see what’s already there to eat. 2) Keep it simple. If you usually have a frozen pizza or corn dogs for dinner once a week, then write that on your menu! Don’t do what I did and think that having a menu will magically make the food easier to cook! 3) Write down seven dinners on paper. If one night will be left-overs or a restaurant meal, write that on the menu – just make sure to account for every night so you don’t accidentally miss one! As you’re writing, you can include the full meal or just the main dish – since we keep things like frozen vegetables and rice on hand, I personally don’t feel a need to write down side dishes, but I know that planned side-dishes may be helpful to other people! 4) Don’t write down breakfast or lunch plans unless you really need to. If you always serve oatmeal, eggs, or cereal for breakfast, and sandwiches or leftovers for lunch, then you probably don’t need a menu for that! 5) Go grocery shopping with a list. This may seem like a no-brainer but I can’t tell you how many times I wrote a fabulous-looking menu, then didn’t actually go to the store to buy ingredients! Or I didn’t think I’d actually need a list and would way over (or under) purchase. So have a list! 5) Be flexible at the store. If you have roast on your grocery list but ham is on sale, buy the ham and change the menu for that evening! 6) Write your menu down in a semi-permanent location after you get home from the store. I have a new chalkboard in my kitchen for writing down the menu – I thought it would feel constricting but I actually love that I don’t even have to think about what’s for dinner because it’s on the menu and I’ve already bought the groceries for it! I am a new military wife trying to find my way as a homemaker and new mom, in a completely different part of the country I grew up in. This is all after living and teaching Kindergarten and First grade for 5 years in the same place, close to my hometown, before marrying my wonderful Coast Guard boat driving husband. One of the reasons I married him was because of the adventure I knew I would have! His job took us literally from one US coast to the other our second year of marriage and I love that kind of adventure. The homemaking adventure is a much rougher one for me though! While, we are so blessed by God to have s0 much given to us by the military that we don’t have to even think about (i.e.. paying bills since we are in housing) there are other military standards pertaining to home keeping I struggle with more. I have had to adopt an “always ready” (the Coast Guards motto) mentality when it comes to taking care of our home. Since we are technically renters of military housing we even get our homes periodically inspected by the base housing staff, sometimes unannouced. YIKES! Organizing a classroom was easy! I mean we got whole days and weeks to devote to doing just that and I had amazing in class assistants and volunteers helping me the whole way. I thought since I could manage a Kindergarten room with 15 five year olds, I could certainly manage a home with 2 capable adults and a baby. WELL let me tell you, I struggle. My husband does have high military standards and I knew this from the beginning, his bachelor pad would put the Chrysler building to shame! We have disagreed with cleaning and organizing from the beginning. My issue is that I feel a level of comfort with things (especially ones I am emotionally attached to) around the house. He just want to get rid of everything we haven’t used in a year! ** This includes photos, books, linens, kitchenware ect…; and he’s willing to spend whatever money it takes to replace them if we find we do need it in the future. While my tendencies tend to create clutter and in turn stress for my husband; his tendencies tend to cause financial stress for our family. We have improved some since having our child (we have both become less concerned about stuff general) however, I feel like we can both keep improving! I like to keep handwritten letters so much but I am truly not a crafty person. I know this may seem odd since I taught young children (my assistants and volunteers worked wonders for me!! ). Therefore, I can’t get motivated to do something to save them except continue to stuff them in plastic zip locks. The problem is that the drawer I am currently using to store these bags in starting to run out of space and I am literally getting nervous about what I will do when that happens! My husband would like me to just throw them away, but I can’t do that! I have always loved looking at cards and letters sent to me even as a little girl and I want to save them for my son and/or and possible future children to look at. Anyways do you have any creative organizational ways to save them? Jenny, I’m glad that you and your husband are working towards a happy medium on this. For the cards and letters, I recommend buying a 3-ring binder and putting sheet protectors inside the binder. Slide the cards and letters into the sheet protectors, put the binder on a bookshelf, and you’re DONE!